Love bowling but hate, loathe, and detest wearing bowling shoes? Of course you do and you do! I mean who wants to have to shove their feet into those hideous looking clown shoes you have to rent at the alley? Ugh. As one of the housewives on Bravo's Real Housewives of OC said recently, after being invited to a girls' night at a bowling alley - Why can't Gucci make bowling shoes? Luckily for all of us, there's no need to stress over being seen in embarrassingly bad footwear, that's probably been worn by thousands of other people, because now there's Breaktime Bowl And Bar at the Hope Artiste Village on Main Street in Pawtucket. 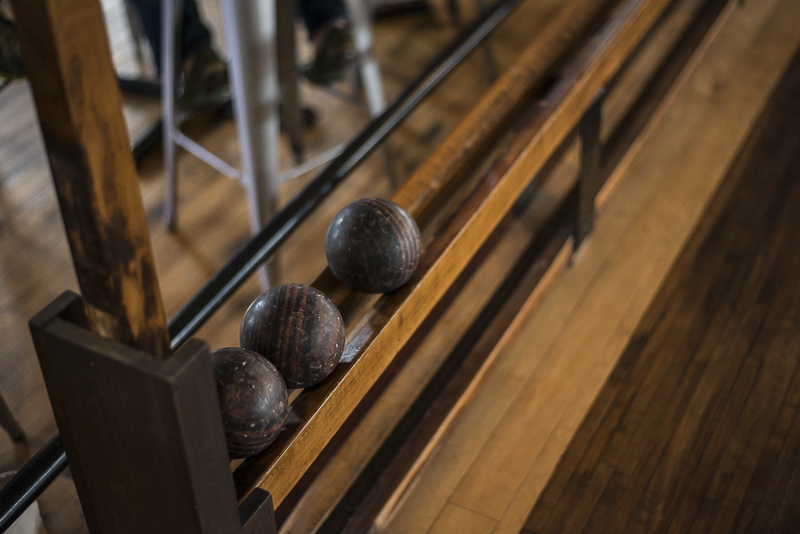 Open 7 days with a full bar and catering courtesy of Blaze, Breaktime also features 100 year old lanes (original to the space and retro all the way), and pin people (or pinners or pin boys...so retro) to reset the duckpins. And again, as you can see from the pictures above, BT does NOT require you to wear the dreaded BS (That's bowling shoes.). Yeah, it's totally ok to wear your sneakers and probably most other street shoes. Not so sure about heels tho because I just saw something online about a 'no heels' policy , but no one there made a peep about my wearing my beloved peep toe Stuart's (That's Stuart Weitzman if anyone from that fine company is reading this and wants to send some free shoes my way. Hint, hint. Wink, wink.) while bowling a pretty decent game (for someone who hasn't bowled in years!) late yesterday afternoon. For all of you out there who still love and adore paper and pencils, you'll be thrilled to know that's how you'll be keeping track of your score. It's a great place to sneak off to before - or during - a show at The Met downstairs. Just sayin. Almost everything I've read about BT says it's 'hipster' or a 'hipster hangout' which, quite honestly, intimidated the heck out of me. Don't know about you, but I've had my share of run-ins with the a few hipster types who were sorta smug and kinda dismissive. Not cool. NOT the case at Breaktime tho. Happy to report that everyone, from patrons to staff, was super friendly and nice. Photo Credits: All photos, except for the Breaktime sign, courtesy of Ashley Farney.